Once you have learned how to do ribbing on double-pointed needles, you will have to learn how to bind off on double-pointed needles. It's really quite easy. Just follow the steps below. Knit the first 2 stitches on the first needle. Insert left needle into the front of the stitch you knitted first and pull it over the second stitch and completely off the needle. Put your index on the second stitch to hold it in place and keep it from falling off the needle. One stitch is now bound off. Knit one more stitch, insert the left needle into first stitch on the right needle and pull it over the new stitch and completely off the needle. Another stitch is bound off. Purl the next 2 purl stitches. Insert left needle into front of the first stitch on the right needle. 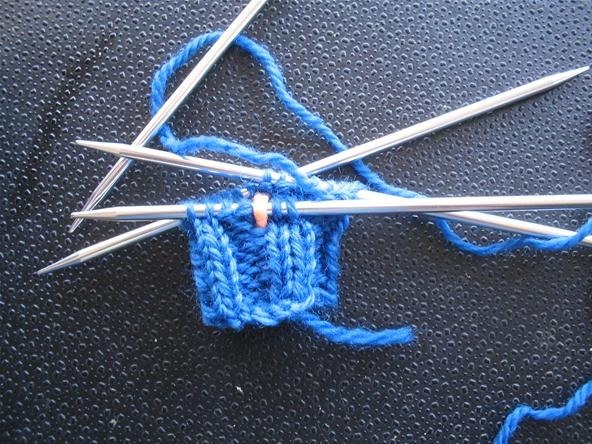 Using the left needle, pull the first stitch up and over the second stitch. One purl stitch has been bound off. Pull right needle forward and let stitch drop off. Purl another stitch and repeat what you did on the last purl stitch. Continue on binding off the knit stitches knit-wise and binding off the purl stitches purl-wise. When you have bound off all the stitches on the first needle, continue to do the same on each of the other needles. When you have one stitch remaining on the last needle, cut the yarn and pull through the loop. Watch this video demonstration to learn how to bind off ribbing on DPNs. Leave a long strand to use later for sewing. If you need to learn how to knit ribbing or how toknit on DPNs,see my other articles.